This year, Danish television is broadcasting the daily Christmas program The Julekalender for the 10th time. It was originally produced in 1991. In Scandinavia, there is a long tradition of television series in 24 episodes of a story that relates to Christmas, all through the month of December. This is called a Julekalender, a Christmas Calendar. The Julekalender is said to be the one that has been most often repeated. A special type of little people, locally called Nisse, plural Nisser, usually play a prominent role in these series. They interact in different ways with the human world, and they are mostly invisible to humans. 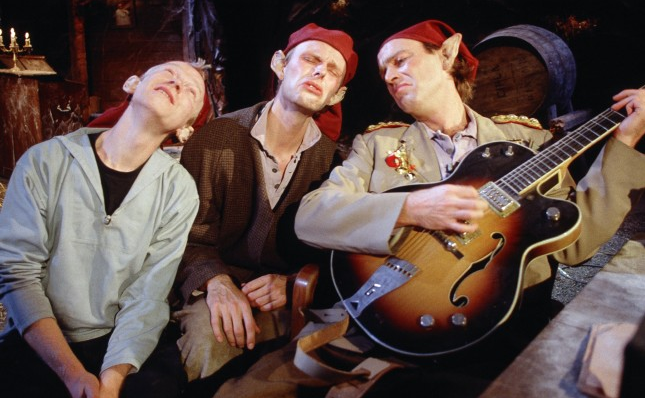 They play a role in Danish folk beliefs – especially for children. The Julekalender has a mixed Danish-English title: the noun is Danish, the definite article the is from English. Whenever The Julekalender is shown on Danish television, the languages used in the Julekalender leads to discussion among the viewers. School children imitate the Jutlandish accent of the Potato trader, and his set phrase “De’ bår dæjli’!” “”that’s just fine”) is used regularly for comical effects in diverse social circles in Denmark. The Copenhagener also attracts attention: “bob, bob, bob”. Most remarkable, however, is the language – or is it a language? – used by the Nisser in the series. They speak a mixture of English and Danish. Lyrics from the song ‘The Støvledance’. 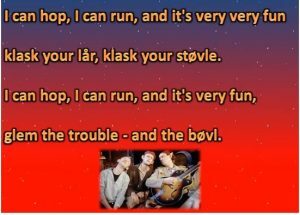 If you want to hear the Danish-English mixed language used in the series, you can listen to one of its most famous songs here: The Støvledance. Strangely enough, people who comment on the language describe the type of mixture in completely different ways. Members of mixed English-Danish families said it was very funny for them, because “we speak exactly like that at home”. Some viewers say that the language has an English grammatical structure and Danish words – or the other way around. Others say the verbs are from one language, and the nouns from another – here again, Danish verbs with English nouns, or the other way around. There are in fact examples of real languages with exactly this type of structure. However, the impressions that people had of the language were completely different from reality – as is often the case with regards to linguistic matters. For instance, most people believe that young people swear more than old people. This has been shown not to be true. Likewise, the impression that adolescent second generation immigrants swear more than their Danish peers was so widespread that the Danish government even announced that they wanted to put a halt to this by setting money aside. (You start wondering, by the way, how you can use money to get people not to swear). But actually Danes of other ethnic origin swear much less than the Danish teenagers. And there is a widespread belief that scientists use less and less Danish and replace it with English. This also appears to be an unsubstantiated exaggeration when the facts are investigated. If one wants to find out how the Nisse-language really is structured in its combination of English and Danish, one has to study this in detail. As I have myself engaged in the study of mixed languages, I was more than happy when one of our students, the fluently bilingual Margaret J. Blake, offered to analyze the language of the Nisser. Her detailed study is the result of her painstaking research on the corpus of Nissesprog. It is an academic work of high standing. People will tend to ask: Why would one study the obviously fictitious language of a species of creatures that few humans have ever communicated with? In fact, people may object, there is no scientific proof that Nisser exist. There are several reasons why it is worth studying this artificial language. First of all, the Nisse-language is a beautiful example of all the creative things that humans are able to do with their language, in this case the combination of two languages. This language is a conscious creation of a small group of people, De Nattergale. Is the result similar to what happens unconsciously in the real world, or is reality of the spontaneous mixture of languages, as done by many humans, beyond the limits of artists’ imagination? We give some examples from American Danish speakers below, so readers can compare. Many bilinguals codeswitch, i.e. they combine two languages in one sentence. The study of this phenomenon sheds light on how the human mind is organized, and on the mental organization of sentence production. One can also mention a few dozen new mixed languages that have emerged and stabilized in the course of the history of mankind. These tend to show structures that are often quite different from what one observes in codeswitching. Do these real languages show similarities in the nature of their mixture with the language combination in the artificially created Nisse-language? How does this relate to the neural capacities of humans? How is it possible that bilingual listeners can understand conversations in which two languages are intricately mixed? Apparently our brain is flexible enough to process two languages at the same time. Neurolinguistic research and the study of bilingualism complement one another. In short, many extremely challenging questions are raised through this language mixture of the Nisser. Margaret Blake’s study, however, does not provide an answer to all of these questions. It does show that there is a certain system to the mixture, but in fact unlike any of the impressions that listeners had. And unlike any of the documented cases of language mixture. In many bilingual communities, people tend to mix languages. This is very natural, and not a sign of language decline. It appears that those individuals who mix the languages most, are often also those who are the best speakers of the two languages separately. This phenomenon is called codeswitching or codemixing. Even though this is superficially similar to what is found in the Nisser’s language, there are important differences.